Featuring eight sessions for a midweek club or special event for children based on a Bible reading structure from Mark, this title explores how Jesus touched the lives of the people around him. It encourages leaders and children to then find out the ways in which they can touch the lives of people around the world. - Publisher "High Five" contains eight sessions for a children's midweek club or special event. The follow-up to "Wastewatchers", "High Five" is based on the book of Mark and explores how Jesus touched the lives of the people around him, taught God's way, and gave up his life to conquer death.Produced in partnership with the Salvation Army International Development, "High Five" caters for 5 to 11s and groups of all sizes and each session will help children think about social justice issues around the world using a variety of creative methods. "High Five" contains eight sessions for a children's midweek club or special event. 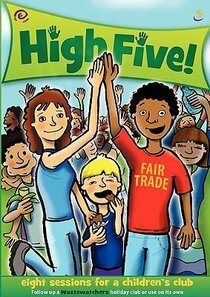 The follow-up to "Wastewatchers", "High Five" is based on the book of Mark and explores how Jesus touched the lives of the people around him, taught God's way, and gave up his life to conquer death.Produced in partnership with the Salvation Army International Development, "High Five" caters for 5 to 11s and groups of all sizes and each session will help children think about social justice issues around the world using a variety of creative methods.